This glass vessel sink from Eden Bath is made of high quality tempered glass. 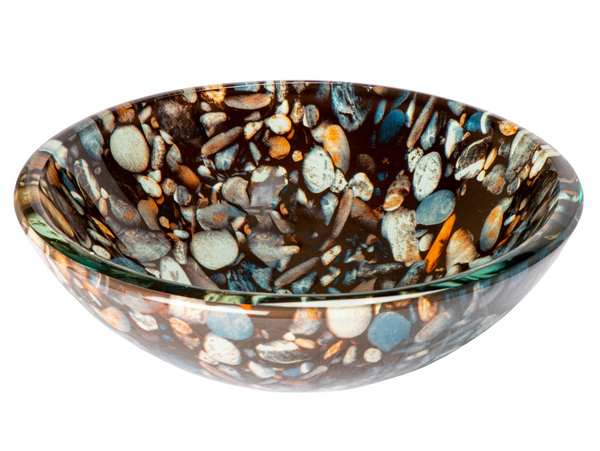 It looks just like our popular EB_GS24, Natural Pebble Pattern Glass Vessel Sink, with an image of pebbles embedded in the glass, But this sink is in a smaller size perfect for bathrooms where space is limited. Eden Bath specializes in unique glass vessel sinks that you won't find anywhere else. We recommend that you also purchase a mounting ring and drain with your glass sink in the same finish of your faucet. Outer Dimensions: D: 14.25", H: 5"